The Royal Australian Mint has released this 1/10 oz Lunar Year of the Dog Gold coin. 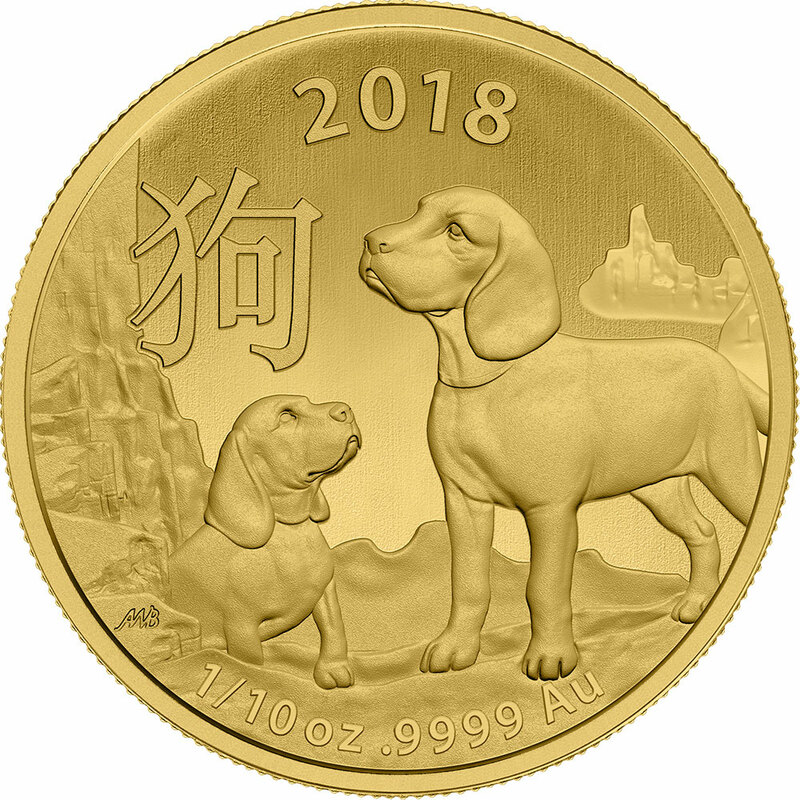 This coin was produced, whose aim is to celebrate the 2018 Chinese Year of the Dog. This amazing coin will be a wonderful new addition to any collection. The Royal Australian Mint always releases a stunning collection of coins for the Chinese Lunar New Year. They were first introduced in 2007, and each year feature a new animal and coin, to coincide with the calendar. The image of Queen Elizabeth the II, depicted by Ian Rank Broadley, always remains on the obverse side of the coin. However, the design on the reverse changes annually. This makes this a wonderful addition to anyone's collection portfolio, investment portfolio or perhaps a thoughtful gift for a special someone. The obverse side of the coin depicts a profile of Her Majesty Queen Elizabeth II along with the gold purity level, and the release date. 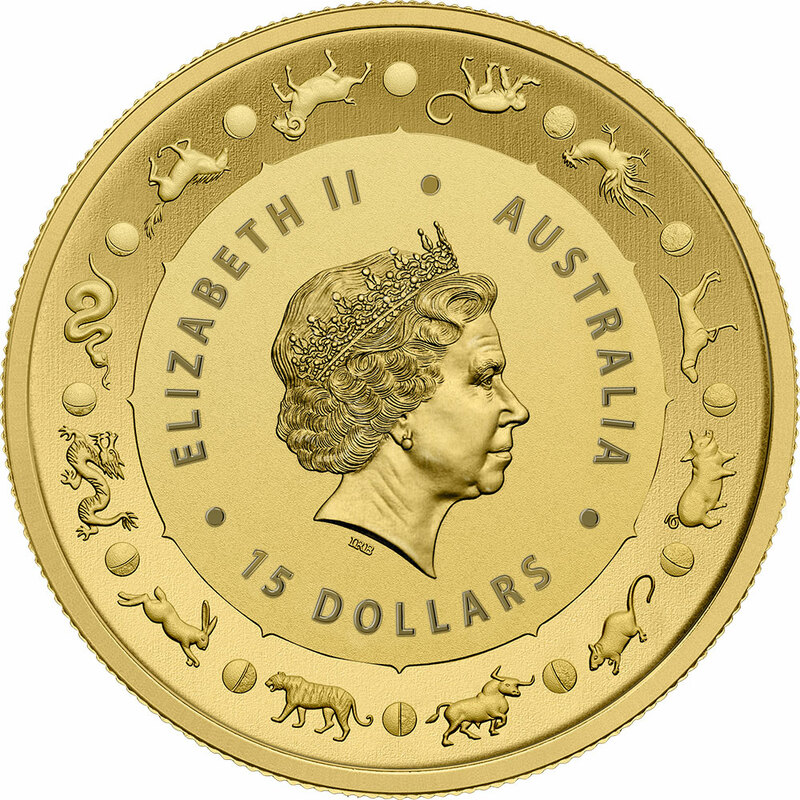 It is considered a tradition to place her on all Royal Australian Mint coins. On the reverse side, we have a detailed image of two Beagles standing proudly accompanied by the Chinese character for “Dog”. Protect your Gold Lunar Dog Coin from fingerprints by using cotton gloves and handing your coin with care. You can also protect your coin by keeping it inside a clear plastic capsule. This will display the coin very elegantly, and also add extra value and presentation to your coin collection. Each year is represented by one of twelve animals that appear in the Chinese Zodiac. This year is being represented by the dog and those born under this animal influence (with the recent years being: 1934, 1946, 1958, 1970, 1982, 1994, 2006, 2018) are said to be faithful to those they love, courageous, warm-hearted and friendly. The story of how the Chinese Zodiac signs came to differ from region to region. However, the most common story talks of 12 brave animals competing in a race organized by the Chinese Emperor. The animals were given a year in the Chinese Zodiac depending on how quickly they finished the race. The dog came eleventh, placing him in the eleventh position of the Chinese Zodiac.